Less than 24 hours before he fired FBI Director James Comey, President Donald Trump nominated 10 lawyers for lifetime positions as federal judges. Trump has repeatedly lashed out at judges who rule against him. It is no surprise, then, that he is rushing to appoint judges who are more likely to rubber-stamp his unconstitutional agenda. To vet and pick these nominees, President Trump relied on the same right-wing groups that compiled his list of potential Supreme Court nominees—the Federalist Society and The Heritage Foundation—organizations that want to push a conservative agenda through the courts. Trump ignored the traditional vetting role of the American Bar Association, bypassed state judicial nominating commissions, and failed to consult with home-state senators. For 100 years, Senate tradition has required senators to approve judicial nominees who would sit on the federal courts in their states. As part of that process, senators sign a blue slip of paper to signal their approval. The blue slip requires presidents to work with senators from both parties to fill empty judgeships. The blue slip process promotes a qualified and moderate judiciary. It is possible for senators to abuse the practice, as Senate Republicans did during the Obama administration, but the practice has survived since 1917 for a reason. Senators are in the best position to ensure that judicial nominees are well-respected in their local legal communities. In many states, senators establish commissions to vet and recommend the most qualified candidates. Given this local knowledge and the blue slip, the president traditionally consults with senators before nominating judges. Trump’s outsourced judicial selection process has led to several worrisome nominees. 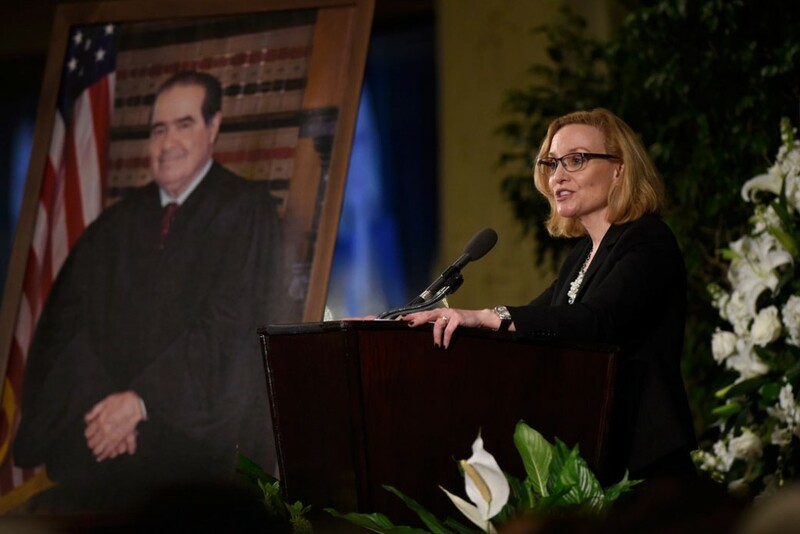 President Trump nominated Justice Joan Larsen to fill a vacancy on the U.S. Court of Appeals for the 6th Circuit. She was also on Trump’s list of potential U.S. Supreme Court nominees. Larsen was appointed to the state high court by Michigan Gov. Rick Snyder (R) in September 2015, meaning that she had less than a year of judicial experience when she was included on Trump’s list of potential Supreme Court nominees. When Larsen ran for re-election in 2016, the Michigan Chamber of Commerce—no friend of working people or transparent politics—supported her with $2 million in spending on television ads. The chamber opposes campaign finance laws and advocates for laws that make it harder for injured people to sue for damages. Larsen also received donations from the conservative DeVos family, including Secretary of Education Betsy DeVos. Like new Supreme Court Justice Neil Gorsuch, Larsen worked in the George W. Bush administration Office of Legal Counsel when it concluded that there were few limits on executive authority when it comes to national security. Larsen co-authored a classified March 2002 memo that addressed whether detainees in the war on terror could go to court to challenge their detention. In 2006, Larsen wrote an op-ed defending then-President Bush’s use of “signing statements,” in which the president signed bills but asserted broad executive authority to ignore them. One of those statements concerned legislation to bar U.S. officials from torturing suspected terrorists. Larsen interpreted Bush’s comments to signal that “if circumstances arose in which the law would prevent him from protecting the nation, he would choose the nation over the statute.” This suggests that presidents can ignore limits on their power, if they think their actions are justified by national security. These crucial questions of executive power could come before Justice Larsen, if she is confirmed. A few days ago, the U.S. Court of Appeals for the 4th Circuit heard arguments about the constitutionality of President Trump’s second Muslim ban. Only an independent judiciary can rein in abuses of executive authority. Senators should ask tough questions about whether Larsen will be an independent jurist who will defend the rule of law and check the president when necessary. President Trump nominated Justice David Stras to the U.S. Court of Appeals for the 8th Circuit. Stras was also on Trump’s short list of potential Supreme Court nominees. During the Obama administration, U.S. senators representing Minnesota established a bipartisan commission representing a diverse sample of the state’s legal community to review judicial nominees. Given this effort to minimize the role of politics in judicial selection, they were surprised when the Trump administration abandoned the process. “I am concerned … by that fact that Judge Stras’ nomination is the product of a process that relied heavily on guidance from far-right Washington, DC-based special interest groups—rather than through a committee made up of a cross-section of Minnesota’s legal community,” Sen. Franken said. Stras has all the markings of a conservative ideologue. After law school, he clerked for Justice Clarence Thomas and still calls Thomas a mentor. Thomas is the most conservative member of the Court and only hires clerks who have worked for Republican-appointed judges. Senators should probe deeply into Stras’ record. In 2012, Stras voted to uphold a misleading ballot question to create a voter ID requirement in Minnesota. He also dissented from a ruling in favor of a police officer’s age discrimination lawsuit. And he sided with an insurance company against a young boy injured in a school bus accident. In a law review article, Stras said that “the Court’s own ventures into contentious areas of social policy—such as school integration, abortion, and homosexual rights—have raised the stakes of confirmation battles even higher.” Stras characterizes school integration as “contentious.” He also implies that advocates for equality should seek justice outside the courts, failing to recognize that the rights of the politically disenfranchised are often only available through a nonpolitical process. In another law review article highlighting “neglected Supreme Court Justices,” Stras defended the late Supreme Court Justice Pierce Butler, who struck down New Deal laws protecting workers and consumers. Stras wrote that Justice Butler consistently supported the “invalidation of state laws that interfered with private property rights, the right to contract, and other economic rights.” However, these rights do not appear in the Constitution. These positions are well outside the mainstream, and the resurrection of these anachronistic ideas could invalidate nearly all the protections for workers that Americans have fought to achieve in the past century. Trump’s outsourcing of the judicial selection process to right-wing organizations has created a needless political conflict with senators over the federal courts. Instead of fanning the flames of partisanship, Trump should honor the Constitution and its requirement that the Senate advise and consent to nominees. The Trump administration must engage senators early in the vetting and screening process and must work with them to find qualified, fair, and independent judges. Jake Faleschini is the Director of the Federal Courts Program at the Center for American Progress. Billy Corriher is the Deputy Director of Legal Progress at the Center.